soil dried out in the March heat, helping to set the stage for a drought that peaked during the warmest July on record. The temperature differences between years are usually measured in fractions of a degree, but last year blew away the previous record, set in 1998, by a full degree Fahrenheit. 34,008 new daily high records were set at weather stations across the country, compared with only 6,664 new record lows, according to a count maintained by the Weather Channel meteorologist Guy Walton, using federal temperature records. Scientists said that natural variability almost certainly played a role in last year’s extreme heat and drought. But many of them expressed doubt that such a striking new record would have been set without the backdrop of global warming caused by the human release of greenhouse gases. And they warned that 2012 was likely a foretaste of things to come, as continuing warming makes heat extremes more likely. 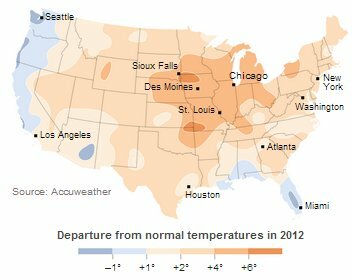 However, last year’s record for the United States is not expected to translate into a global temperature record when figures are released in early 2013. The year featured a La Niña weather pattern, which tends to cool the global climate over all, and scientists expect it to be the world’s eighth or ninth warmest year on record. Assuming that prediction holds up, it will mean that the 10 warmest years on record all fell within the past 15 years, a measure of how much the planet has warmed. Nobody who is under 28 has lived through a month of global temperatures that fell below the 20th-century average, because the last such month was February 1985. Extensive records covering the lower 48 states go back to 1895; Alaska and Hawaii have shorter records and are generally not included in long-term climate comparisons for that reason. Mr. Crouch pointed out that until last year, the coldest year in the historical record for the lower 48 states, 1917, was separated from the warmest year, 1998, by only 4.2 degrees Fahrenheit. That is why the 2012 record, and its one degree increase over 1998, strikes climatologists as so unusual. “We’re taking quite a large step above what the period of record has shown for the contiguous United States,” he said. In addition to being the nation’s warmest year, 2012 turned out to be the second-worst on a measure called the Climate Extremes Index, surpassed only by 1998. Late in the year, Hurricane Sandy, which caused damage likely to exceed $60 billion in nearly half the states, primarily in the mid-Atlantic region. The Derecho, a line of severe, fast-moving thunderstorms that struck central and eastern parts of the country starting on June 29, killing more than 20 people, toppling trees and knocking out power for millions of households. For people who escaped both the derecho and Hurricane Sandy relatively unscathed, the year may be remembered most for the sheer breadth and oppressiveness of the summer heat wave. By the calculations of the climatic data center, a third of the nation’s population experienced 10 or more days of summer temperatures exceeding 100 degrees Fahrenheit. Among the cities that set temperature records in 2012 were Nashville; Athens, Ga.; and Cairo, Ill., all of which hit 109 degrees on June 29; Greenville, S.C., which hit 107 degrees on July 1; and Lamar, Colo., which hit 112 degrees on June 27. With the end of the growing season, coverage of the drought has waned, but the drought itself has not. Mr. Crouch pointed out that at the beginning of January, 61 percent of the country was still in moderate to severe drought conditions. “I foresee that it’s going to be a big story moving forward in 2013,” he said. The drought engulfed 61 percent of the nation, killed corn and soybean crops and sent prices spiraling. It was comparable to a severe drought in the 1950s, but not quite as severe as the legendary Dust Bowl drought of the 1930s, which was exacerbated by poor farming practices that allowed topsoil to blow away. This page was last modified 22:17, 8 January 2013.